When I first read the back of this DVD, I actually thought that the Muscles from Brussels actually hit rock bottom. 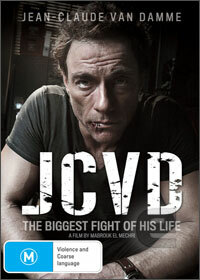 Embarrassingly wrong, JCVD (Jean-Claude Van Damme) is a drama comedy that is directed by Mabrouk El Mechri and stars Jean-Claude Van Damme and Francois Damiens. Unlike those bad 80’s and 90’s movie such as Bloodsport or Cyborg, this is a much more mellower action star who seems to have matured in the world of movies. Almost paralleling Mickey Rourke’s The Wrestler, Jean-Claude Van Damme stars as himself, a washed out shadow of the man he once was. For now, Jean-Claude is fighting another battle, that of the custody of his own daughter and to compound the situation, he is almost destitute as he attempts to pay his lawyers. The kick in the stomach is yet to come as his close rival in Martial Art films, Steven Seagal has just stole a role from him. Unable to live in the US anymore, JVCD packs his bags and heads home to Belgium. Unfortunately his luck does not return and he is mixed up during a robbery attempt in the town of Schaerbeek. The criminals even force Van Damme to become their spokesperson which in turn many people believe that he is part of this elaborate plot. Interestingly enough, director Mabrouk El Mechri creates a clever movie that is split into three different view points, one from Van Damme, the police and Commissioner Bruges (Francois Damiens). These different viewpoints gives the viewer an insiders knowledge of how the world and certain individuals portray Van Damme, including himself in this movie. There is a wonderful scene in the movie which involves Van Damme and one of his captors who is a huge fan of the Muscles from Brussels. It's moments like this that make the film so damn impressive. With some brilliant acting by Van Damme and his co-stars, this may be a real turning point for this action star in a truly inspirational and at times pathetic movie about a broken man. The video quality is muted with dull colours which actually suits the storyline perfectly and the sound and music only compliments the story even more. For those that love special features, it includes some deleted scenes, the making of JCVD which adds some interesting insights into the creation of the film and also Van Damme’s move from action to comedy drama. VCVD is a classic film!